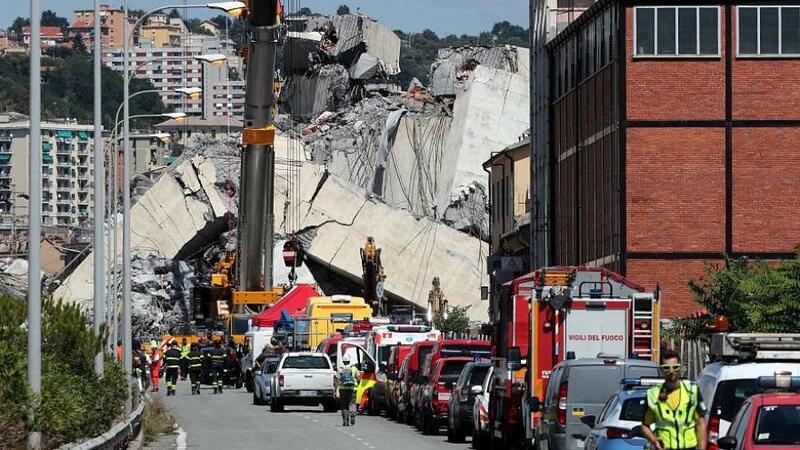 When a 260-ft.-long span of a heavily traveled highway bridge collapsed in Genoa, Italy on Aug. 14, speculative causes of the collapse immediately were flung around like flying debris. The shoot-from-the-hip reaction used to be called “instant analysis” and helped foster public cynicism about the media. Prof. Eduardo Kausel was one informed observer not impressed with the quick judgments made about the Genoa tragedy. “Although in the hours immediately following the collapse of the bridge, I shared with my Italian colleagues my initial speculation on possible causes of the disaster, it is still way too early to tell,” said Kausel, a professor in the Civil and Environmental Engineering Department of MIT with special interest in structural dynamics. His professional observations were privately shared with peers, in contrast to public demands that the person responsible for the collapse be found. The bridge was designed by Italian civil engineer Rocardo Morandi and completed in 1967. It features huge A-frame towers that support concrete-encased cables combined with V-shaped supports below the deck. Most cable-stayed bridges are not stiffened with such supports. The structure was similar to a bridge in Venezuela and was, according to Kausel, a virtual clone of the Wadi el Kuf Bridge in Bayda, Libya, which was closed last year because of discovered defects. Concrete structures are somewhat controversial in Italy. That's because the industry has been heavily infiltrated by organized mobsters—the mafia—which makes money by using more sand in its sand-cement mix than is recommended, thereby compromising the strength of the resultant concrete. The practice dates to the 1950s when Sicily began to rebuild after World War II and mafia leaders won building contracts to profit from the boom. The collapse of several Italian bridges over the last decade has been tied by some observers to the weakened construction material. In 2009, flooding in a Sicilian town led to collapse of some concrete buildings that shouldn't have fallen if properly constructed. But bridges collapse in places other than Italy for reasons other than suspect concrete. In Minneapolis ten years ago, an eight-lane bridge tumbled into the Mississippi River, killing 13 people. The cause of that failure eventually was determined to be a too-thin metal plate joining several girders. The plate was adequately engineered for the initial load, but as the bridge gained weight with the addition of concrete lane dividers and so forth, it proved too weak. Additional weight was suspected to have put additional stress on the Genoa bridge. Both structures were erected in the 1960s. A common thread running through all of the bridge news is that the infrastructure is getting old. The post-World War II reconstruction and expansion of infrastructure has bridges in many countries feeling their age. In France, a government audit arrived at 840 as the number of French bridges at risk of collapse in the next few years. The report concluded that a third of the 12,000 government-maintained bridges need repair with seven percent of them — 840 — on their last legs. An estimated $1.14 billion will be required to fix the bridges, as well as tunnels and other roadway features, according to a government spokesman. The United Kingdom is similarly strapped. A survey by the RAC Foundation concluded 3,500 bridges are not strong enough to support a 44-ton truck, which are the heaviest law allow on the roads. What is revealing is that the 3,500 identified structures are an increase of 45 percent from just three years ago, suggesting that the situation is deteriorating. A similar investment is anticipated to correct the problem. In the U.S., the American Society of Civil Engineers keeps track of infrastructure issues. Its 2017 report card gave the stock of 614,387 bridges spanning the country a C+. Almost 40 percent of the bridges are 50 years old or older. Some 56,000 of them were graded structurally deficient, which means the bridges have lost some strength or surface integrity but are not actually unsafe. To rehabilitate all those structures will cost some $123 billion. The Federal Highway Administration is the agency that oversees highways and bridges in the U.S.
Agency officials say they have expressed a willingness to help with the Genoa investigation. The scope of its involvement will be determined at the time any such request is forthcoming. Kausel has some thoughts on why the Genoa structure fell but is reluctant to publicly speculate. "The remnants must first be examined, the materials tested, the connections and supports verified before judgment can be passed.” What he knows for sure is that the tragedy, which claimed 39 lives, will have motorists thinking about the bridges they are crossing.